In the Queen of Pentacles, a woman sits on a stone throne decorated with carvings of fruit trees, goats, angels and other symbols of material success and sensual pleasure. She cradles a gold coin with both hands and looks down on it with loving care, as if to nurture this symbol of wealth and material success. Luscious plants and flowers surround her, representing her connection to Mother Earth, nature, and abundance. A small rabbit jumps near to where she is seated, symbolising fertility and suggesting that her life is in flow and alignment. 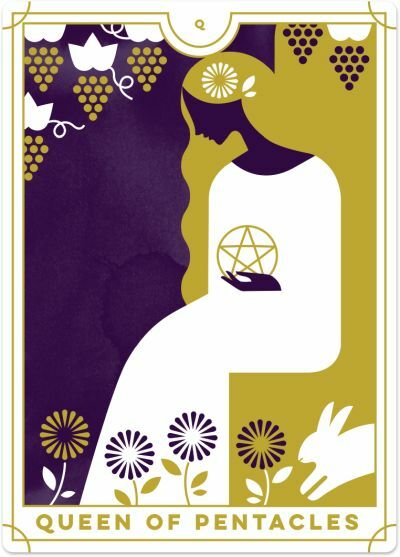 The Queen of Pentacles is the nurturing mother of the material world. At home, she shows her love for others by cooking nutritious meals, maintaining a clean and inviting home, and giving warm cuddles to those who need it most. She is also able to work a full-time job and make a financial contribution to the household, often as the primary breadwinner. She is masterful at taking care of the practical needs of work, home and family, while also giving her love and support to those she cares about. When the Queen of Pentacles appears in a Tarot reading, you are embodying the ultimate working parent archetype. You care for your family and domestic responsibilities while also making a living for yourself and creating financial abundance. You can maintain a healthy balance between home and work by integrating the two and finding your place of ‘flow’ and alignment. You strive to create a warm and secure environment for your family and loved ones while giving your love and support freely. Similarly, the Queen of Pentacles suggests that it is important to you to live independently, with a stable income and with enough time and space to also nurture your loved ones. You may be trying to strike a better balance between your home and work lives, giving it your all in both domains. At the same time, you find time for yourself and prioritise ‘me’ time in between all of your other commitments. The Queen of Pentacles represents prosperity and security. You have worked hard to generate a level of financial or physical security, which in turn gives you the ability to be generous with others and to share your wealth and abundance with those you love. You have used your financial prosperity to build a comfortable home environment and are as focused on investing in your family as your personal wealth. This Queen asks you to maintain a compassionate, nurturing, practical and down-to-earth attitude when dealing with others and your present circumstances. Focus on creating a calm and balanced life for yourself. Be resourceful and practical, dealing with issues as they arise using straightforward solutions that fix the problem with minimal fuss. At times, the Queen of Pentacles may represent a mother figure in your life who can provide you with loving support and nurturing to help you get through the influences of your past. She may be a teacher, a counsellor, a mentor or someone who you are very close to. Alternatively, if you are investing a lot of yourself into nurturing and caring for others and creating an established and comfortable lifestyle, she may represent a part of you.